Here in the farm country of eastern Pennsylvania we spend at least one day a year slaving over a big copper kettle making a voluminous patch of apple butter. The orange-burnished kettle that I own has come down through generations and I know stories that date back before the days of European immigration. And that’s one kind of kettle, but I’m sure you’ll be more interested in the second one. 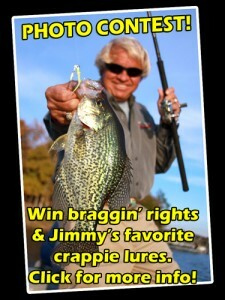 When pursuing crappie in the shallow flats of five feet or less, the key is to stay off the fish for success like this. Then there are a couple of other days per annum when another kind of Pennsylvania kettle becomes important. This is when I travel west of my home to fish what geologists call a “kettle lake.” One particular kettle, called Conneaut Lake (roughly pronounced con-EE-auht), is an astoundingly beautiful and productive crappie water. When I fish the kettle Conneaut I know I’ll be working jade clear water where the crappie, in their black and silver splendor, are so deeply colored as to rival a midnight rainbow. 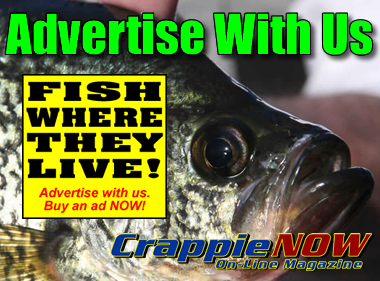 So happens Conneaut is one of three kettle lakes I have fished east of the Rockies, from New York to Iowa, and each one, for its size and substance, is an excellent crappie fishery. One kettle, Artist Lake on Long Island, New York, feels like an overgrown farm pond in size, just 30 acres; Conneaut in Crawford County, Pa. is 925-acres while the largest I’ve worked, Clear Lake in Iowa, is nearly 3,700 acres. Each is scientifically known as a kettle lake or a “kettle hole” and while the appellation doesn’t mean they have any connection to apple butter, it does mean they were all formed by tremendous geologic forces in the last Ice Age. Kettles are formed in number of ways. However, they have in common a retreating glacier that leaves behind a gargantuan block of ice. This block is buried by sediment and then melts, forming the lake’s key depression and originally filling it with water. By their nature kettle lakes — and there are many across America — do not have an outlet or an inlet, although in modern times some have man-made dams used to contain and raise the water level. Typically kettle lakes are surrounded by wetlands — or were before the wetlands were ignorantly drained — and they are ground-water infused. Large kettle lakes certainly obtain most of their H2O holdings not from precipitation but from underground springs. If the wetlands still exist, as at Conneaut, the marshes are infused by seepage from the nearby kettle lake. Kettle lakes can produce nice crappie. This action should run from now through the fall. It would be nice to say that structurally all kettle lakes are similar, but they are not. Though some have comparable construction each has its own idiosyncrasies which render them sui generis. In the category of comparable factors, kettle lakes hold very clear water — an important consideration when fishing — and often have substantial humps that rise from the deepest bottoms to within a few feet of the surface. Large kettle lakes usually have a very deep basin. Of course, all of these elements relate to how kettle lakes are crappie fished. Now that the geology lesson is over let me tell you how to be successful on kettle lakes, using Conneaut as the prime example. Understand that on kettle lakes there is no such thing as bumping the stumps because there are no leftover stumps; also you won’t be hugging channels when fishing kettle lakes because there are hardly any channels on these ancient glacial forms. Fishing bridge pillars or bridge abutments is also generally out as few kettle lakes are crossed by roads and bridges. All of this limits the techniques and ploys that contemporary crappie anglers use. 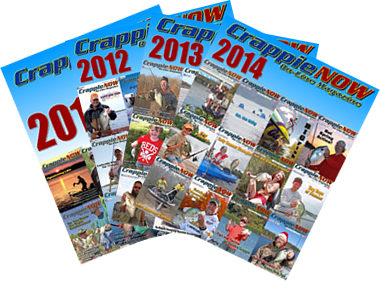 Also crappie act, or travel, differently on kettle lakes than they do on manmade impoundments or giant natural lakes. In kettle lakes crappie will, of course, move to the shallows to spawn, but on most kettle lakes these shallows are not located around the shoreline edges. 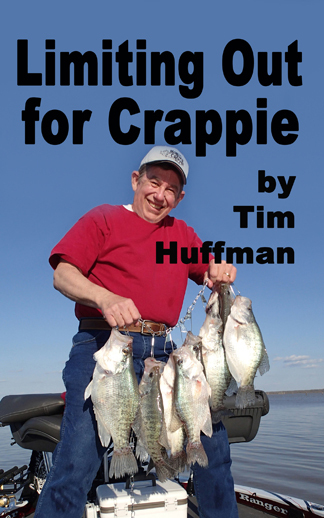 On kettles the majority of spawning crappie will be found on the extensive shallow flats away from the shorelines. You can’t say that a crappie isn’t beautiful. Some of the best black crappie often come from the clearest waters. Typically, kettle lakes are extensively developed — real estate wise. The lakes have existed a long time so the shores are usually privately owned. With this hominid development comes docks and riprap walls. Continuing with Conneaut as an example, its docks are not in deep water — and the shoreline landscape has been so altered — so its docks are not the best spawning areas. Because of this, anglers targeting pre-spawn and spawn crappies should look to shallow flats away from man-made construction. But do not read “shallow flats” to mean shoreline flats. Instead, spaces along the first major drop-off out from shore are a kettle’s shallow flats and are key spawning sites on these lakes. If there are wetlands bordering a kettle lake then the shallows leading up to the swamps, with an assortment of dry spits, small grass islands and all the customary swamp-edge features become important spawning areas. Now in fishing, when you can find shallow spawning areas in water less than five-feet deep, you shouldn’t continually ride over the sites with your boat. Instead quietly position the craft inside the flat, adjusting as necessary, or stay just outside the flat and cast to it. When pursuing crappie on shallow flats — those only five feet deep or less — the key is not to repeatedly motor over the fish. You should work them by simpler means such as casting a fixed or slip bobber with a jig and soft plastic or initially attacking the spawning shallows with a hard stickbait or crankbait through the nest area. If you’re handy with a fly rod, casting lightly weighted streamers on spawning flats is a dynamite technique. I’ve left the spawning shallows of Conneaut after several hours with a fly rod thinking I just experienced an unparalleled day of crappie fishing. However for most anglers the vast majority of spring catches are made casting a bobber and jig and working the jig back to the boat with a tricky set of stop-and-go retrieves. The bulk of crappie fishing on kettle lakes will take place post-spawn and throughout the summer and into the fall. This is where another element of kettle lake construction comes into play. Now it’s all about finding mid-lake structure — and in the shank of summer structure with weeds. For the most part, the sought after structure is not man-made but nature-created construction. Frequently kettle lakes are graced with tower or dome-like humps that rise considerably from the depths. The humps were formed by the way the glacier ice was kicked around or the sediment flowed against the chips-off-the-old-block. The best of these humps rise close to the surface. On all kettle lakes it is either the depressions or the humps that are key post-spawn, summer and fall structures. On Conneaut it is both the pinnacles and the steep or sloping sides that hold three-season crappie. Two good ways to work these places are by quietly drifting over the target areas or else by anchoring off to the sides, then casting onto the humps. The speed of the wind and the wind direction will determine which of the two ploys is better. I’ve been with some pro crappie anglers on Conneaut who edged the humps with a spider-rigged boat; they did okay. But by and large those keeping their distance and casting to the humps did better. Once again, fixed and slip bobbers tethered to jigs are a winning technique. Depending on how the crappie are reacting, the jigs are adorned with either soft plastics or minnows. Also effective, at least initially, are crankbaits and small stickbaits. The bottom line on kettle lakes is that simple tactics are often best. When making apple butter in a copper kettle, it’s the quality of the apples that’s key; on kettle lakes pick the apples, and the crappie, with care.